What would this new participatory story genre look like? Some of its conventions are clear, based on the way people have wanted to connect with existing story worlds and multiplayer games: It will involve an internally consistent but puzzling fictional world, an authored but participatory plot, and an encyclopedically large cast built around a small number of iconic figures. The shape of future inventions can be glimpsed by consulting our own frustrations with existing media patchworks. For example, on the web, viewers can pose theories and argue about the interpretation of episodes and scenes, but they can’t point to them or excerpt them yet. In a format that was custom made for participatory story telling, viewers would be able to create precise pointers to parts of an episode, and assemble them for replay or post commentaries linked to the exactly the moment that proves their point. They would be able to create and share their own playlists to emphasize a particular point of view or follow an important story thread. The elements that currently take place in separate game worlds could also be more closely integrated with the unfolding action so that they could inflect (but not disruptively alter) the course of the actor-played, scripted main characters. There would still be a division between the scripted actor-focused story and the interactive one, but some large events — an alien invasion, a blinding snow storm, an epidemic of the hiccups — could be shared, reinforcing the sense of immersion in a single narrative world. Just as daytime soap operas used to bring all the characters together for a party or a funeral every season, participatory dramas could arrange large events like battles, contests, telethons, sales of virtual merchandise, or the release of puzzle clues that would synchronize the work or the partisan actions of teams of viewers within an unfolding dramatic situation. The Defiance series planned for the SyFy network and for an associated MMO is one opportunity to start defining some of these conventions, and they’ve taken a good first step in setting up the game world as taking place in another city, but within the same fictional universe or storyworld. The thirst of fans for access to secret communications could also be accommodated in a more integrated manner. For example, a character could be shown writing an email or text message, and some viewers could gain access to the contents of the message on a synchronized display, like a tablet remote, by situating themselves within the fictional world as allied to one point of view or another. Not all shows in this future integrated medium would have the same kind of interactivity. Some would be more like current television shows, but they would have affordances we now go to the web or the DVR to find, such as access to backstory, character profiles, actor’s filmography (where do I know that guy from? ), or the kind of on-screen informational captions that Lost was forced to resort to in its last season just to keep people informed of the over-elaborated and highly confusing story – but that would also have been useful on The Wire. It is always easier for me to see the direction of change than it is to identify the time frame in which a particular moment of invention will occur. The emergence of integrated interactive stories is getting closer as TV, console games, and the internet converge on the same living room screen. But it is not technology that will drive it. The arrival of the new genre will come with an act of the imagination, similar to the first Star Wars films, when someone conceives of a coherent multi-episode, multi-season story, in an elaborately detailed and mysterious world with room for large participatory groups in well-defined but open-ended roles, It may be a science fiction universe or an historical adventure or a romantic soap opera or a western or gangster story. But it will be a world that people will want to inhabit as well as view, one where the viewing reinforces the delight of participating and the participation reinforces the richness of viewing. It will be a story with multiple conflicting points of view or compellingly ambiguous moral choices or a multi-layered symbolic mystery, or some other special complexity. In other words, it will be a great story that could only be captured in a new interactive medium, and the demands of that story will lead to a new synthesis of media conventions, that will seem graceful, inevitable, and not “trans” anything. 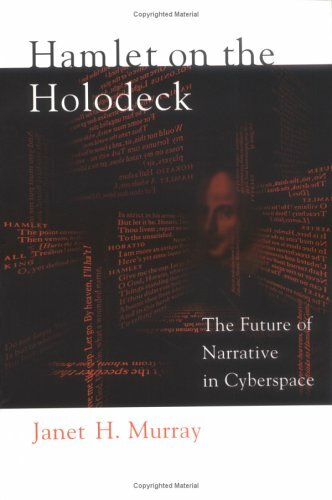 This entry was posted in Ch 1 Design in an Evolving Medium, Design of the Unfamiliar, Interactive Narrative and tagged Hamlet on the Holodeck, Immersion, transmedia. Bookmark the permalink.